I am in dim sum mood lately. Today lunch was some fried beef buns. Easy to make, soft and crunchy at the same time while they are still hot, very tasty. Cooking method is very similar to war tip dumplings. I have made enough for work lunch in the next couple of days. Mix the bread dough till you get a soft dough. Knead for 2 -3 minutes in a bread machine of by hand. Leave aside to rise till double in size (about 1 hour). While the dough is rising, mix the meat filling and set aside. When the dough has risen, tip it onto a flour dusted working area. Give it a quick knead, leave for 2 – 3 minutes to rest. Then roll it out to a rod shape about 3 cm thick and cut equally to about 15 pieces +/- 1. For 15 pieces, each will weigh around 33 – 34g per piece. Roll each piece into a ball with hand dusted with flour, cover dough balls with cloth. With hand dusted with flour, stretch each ball like in the slide show till you get a disc around 6 -7 cm wide, fill it will a lump of meat. Then gather the edge together, pinch and seal it. Flatten the bun with fingers. Coat the sealed end side with plenty of flour, then place the floured side onto a tray (if not enough flour, the buns will stick and difficult to take out later). Leave to rise for about 20 – 30 minutes. Take a large frying pan brush with about 1 tsp of oil, heat till medium hot, pick up the buns carefully with a spatula and place them on the frying pan. Fry at medium heat for a minute or two or till the underside is golden brown. Flip the buns over, drizzle on 2 – 3 tbsp of water around the buns. The water will sizzle, cover the pan and let it steam and fry for about 3 - 4 minutes, checking about 3 minutes to make sure the underside is not too brown. Once all the water has gone and the underside is golden, flip them over again, cover and cook for another 30 second – 1 minute. Ready to eat while hot on its own or dipped with sweet chilli sauce, soy, or a ginger black vinegar sauce. It has been a great pleasure to cook this, so I have to say a big Thank You! 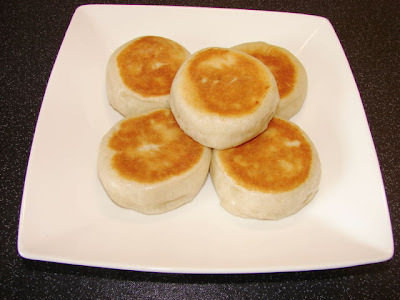 I just made some English muffins (not sure what it is called in UK).The method and appearance look similar to these. Of course without the beef filling. Thank you for sharing the recipe. I would give it a go. Think you may be talking about English muffins. Made these yesterday. the kids & I love them! My first batch of dough did not rise so I made a 2nd batch of dough. This time, I read on my active dried yeast box it needed to be mixed with water before adding to the flour. After 4 hours then did my first batch of dough risen. Now I have a batch of dough, any suggestion what I can use them besides making the beef filling? Thank you for sharing your recipe! You must have normal granular yeast than quick yeast. Yes granular yeast needs to work with water first. This is a standard dough. Make anything you like. Wrap it with any filling savory or sweet like red bean paste, then steam or bake. If not just make some plain small buns or mantou. To steam make the buns then only need to rest for about 20 minutes. To bake you need wait longer till the buns have risen quite a bit before baking.